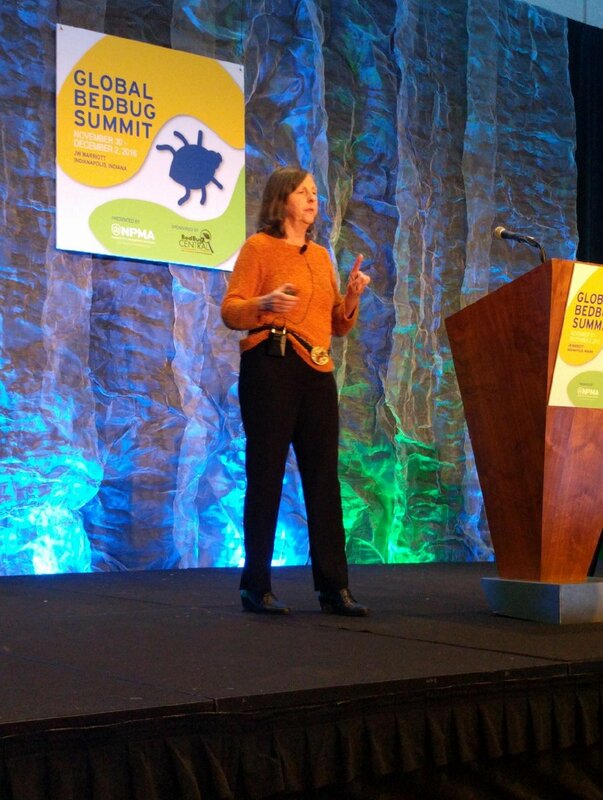 Industry experts convened in Indianapolis, IN from November 30 – December 2, 2016 to share the latest bed bug research and control strategies at this year’s Global Bed Bug Summit hosted biennially by the National Pest Management Association (NPMA). Pest professionals in attendance walked away with the latest news and views on bed bugs from a scientific, business and field perspective. Mark Feldhaufer, Ph.D., United States Department of Agriculture gave the USDA’s Update on Bed Bug Chemical Ecology focusing on two questions: ‘Do I have bed bugs?’ and ‘How do I eliminate them?’. He discussed the use of canine as well as traps, monitors and lures for bed bugs detection and even spoke on whether we should consider bringing back DDT. His feeling is it is unlikely that DDT would be effective as a control measure. Dr. Susan Jones of The Ohio State University brought to light the lack of focus on bed bug prevention. Dr. Jones stressed the importance of education and the use of active liners like ActiveGuard Mattress Liners that kill bed bugs as an important proactive preventive measure and future trend in the marketplace. Dr. Jones also described the establishment of a national consortium of the nation’s top urban entomologists to participate as principal investigators in a study entitled, “A Field Demonstration of a Financially Sustainable Protocol for the Management of Bed Bugs (Cimex lectularius) in Low-Income Housing.” This two year, multi-site study is dedicated to controlling bed bugs in a housing environment that has become a central repository for bed bugs. Travis Aggson, A.C.E. from American Pest Management Inc. spoke on Creating Treatment Protocols where there are no beds. Bed bugs are turning up in businesses and other public spaces more and more frequently. Aggson offered tips for developing treatment protocols in accordance with Integrated Pest Management when every environment is different. Andrew Feldstein, President & Owner of Assured Environments, NYC’s largest pest management provider spoke about ‘Bed Bug Business Models, Then & Now’. Feldstein examined how the bed bug market has matured over the years and an infestation has gone from hysteria to a more universally accepted event. He outlined his company’s Residential Bed Bug offerings from Premium to Basic, Proactive and even Green. “Thank you to both the National Pest Management Association and Bed Bug Central for providing such an ideal forum for learning and the sharing of ideas and strategies among the country’s top bed bug experts. Allergy Technologies was proud to once again be the Platinum sponsor at this year’s event,” shared Joseph Latino, President of Allergy Technologies LLC, maker of ActiveGuard Mattress Liners.